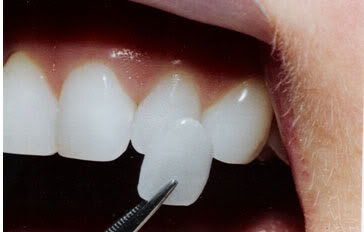 Porcelain veneers are thin shells of ceramic that bond directly to the front surface of the teeth. They are an ideal choice for improving your smile and have become increasingly popular because of their simplicity and versatility. Placing custom veneers requires a high degree of technical skill plus a great attention to aesthetic detail. We place veneers often and design each case individually to match and enhance the characteristics of each patient’s smile. With proper care, porcelain veneers will brighten and protect your smile for well over a decade. Dr. Guess will ensure that your veneers are crafted from the highest quality porcelains and are bonded with the most advanced and proven materials available. Not using your veneers as tools to open and cut things will prolong their life. If accidental breakage or damage occurs, it is usually possible to replace only the veneer involved.